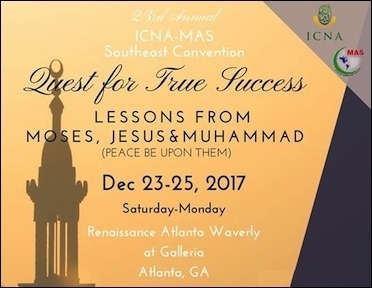 The 23rd annual ICNA-MAS Southeast Convention in Atlanta earlier this month featured a host of extremist speakers. Last weekend, metro Atlanta was the site of a convention for two controversial Muslim groups, the Islamic Circle of North America and the Muslim American Society. ICNA began in 1971, as the American arm for Pakistani Islamist group Jamaat-e-Islami, an organization linked to the Taliban. MAS started in 1993 and federal prosecutors dubbed it "the overt arm of the Muslim Brotherhood in America." Speakers have led a Muslim Brotherhood mosque, preached that anti-Semitic hatred is understandable, written that homosexuality was a quick way "to earn God's wrath" and promoted groups like Hamas. A speaker's CAIR chapter posted an image: "Build a Wall of Resistance/ Don't Talk to the F.B.I." Just as nobody should tolerate a white supremacist convention at a hotel, so the same standard must apply against theocratic supremacists such as ICNA and MAS. David M. Swindle (@DaveSwindle) is a Coordinator of Islamist Watch, a project of the Middle East Forum.